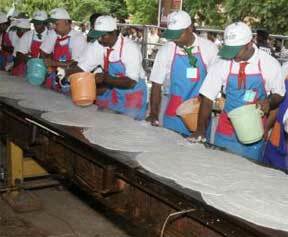 Vijayawada: A 38.2 feet long dosa cooked by Vijayawada Hotels Association has entered into the Guinness Book of Records as being the biggest dosa ever made. Onlookers' curiosity and anticipation were aroused as dosa batter was poured into the tawa from buckets. At the appointed hour, all dosa masters poured the batter, spread it and then joined their own batch with those of their neighbours. Given that there could be just one attempt at the record, and that a perfect dosa was required to fulfil the criteria, tensions ran high. Rolling, the toughest part, had to be done without damaging the dosa or tainting the colour. Once the crispy brown dosa was ready, Ms. Smith had it measured and announced, amidst cheers, that the South Indian delicacy measured 38.2 feet long. She then handed over a Guinness Book of World Records certificate to the representatives of the association. The President of the Hotels Association Pattabhi said it has broken the record that was earlier held by Sankalp Restaurent, Ahmedabad which had cooked 32.5 ft long dosa to make it to the Guinness Book.